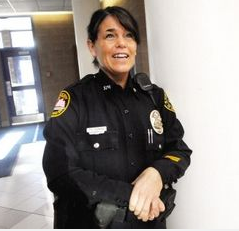 Rachel Horning, the School Resource Officer for the Kittery School Department, is featured on the front page of today's Portsmouth (N.H.) Herald. Horning, who splits her time among the three schools in the district, is in her first year on the job. Horning makes sure all the school buildings in the district are secure, and also handles cases involving bullying, drugs and alcohol, and other student-related issues. To read the full article (written by Deborah McDermott), click here. Photo at left taken by Deb Cram.